Sony Classical announces the release of Joshua Bell – The Classical Collection, a 14-CD set of albums of classical repertoire that the internationally acclaimed, Grammy® Award winning violinist has recorded for the label over the past twenty years. The collection is available worldwide on August 18th, 2017. Displaying the unique breadth, versatility and breathtaking virtuosity, beguiling sensitivity and sheer tonal beauty that has made Bell an icon for audiences of all ages and musical tastes throughout the world, this new collection showcases Joshua Bell in cornerstones of the violin concerto repertoire, chamber music and concert pieces. 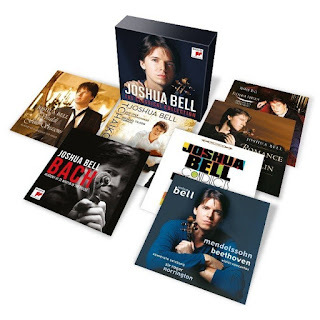 The repertoire in this career-spanning edition includes Bell's 2008 recording of the Vivaldi Four Seasons with the Academy of St Martin in the Fields (for which Bell has served since 2011 as Music Director), the 2014 Bach release, also with the ASMF, and two of Joshua's most popular albums Romance of the Violin and Voice of the Violin, where the violinist regales us with arrangements from Monteverdi, Mozart, Schubert, Chopin and Bellini to Dvořák, Debussy and Orff. Other highlights from the collection include British composer Nicholas Maw's Grammy® Award winning Violin Concerto , a work written for Bell in 1993, featuring the London Philharmonic Orchestra with Sir Roger Norrington, conductor; The Red Violin Concerto based on themes from John Corigliano's score to the film The Red Violin, with the Philharmonia Orchestra London and Esa-Pekka Salonen and Leonard Bernstein's cherished West Side Story Suite, also performed with the Philharmonia Orchestra London and David Zinman. Rounding out this boxed set are Bell's recordings of treasured masterpieces by Beethoven, Mendelssohn,Tchaikovsky, Brahms, Gershwin, Ravel, and Sibelius – accompanied by the Berlin Philharmonic and Michael Tilson Thomas, the Los Angeles Philharmonic and Esa-Pekka Salonen, the Salzburg Camerata with Sir Roger Norrington and Bell's close friends and regular chamber music partners, cellist Steven Isserlis and pianist Jeremy Denk. Bell is also featured as Music Director in riveting performances of Beethoven's Fourth and Seventh Symphonies with the Academy of St. Martin in the Fields. Sony Music Masterworks comprises Masterworks, Sony Classical, OKeh, Portrait, Masterworks Broadway imprints. For email updates and information please visit sonymusicmasterworks.com/.